For my February book of choice, I decided to play it safe with a novella that I knew I would be able to finish before the end of the month. Let's be real, February has less days & I was a little behind schedule finishing My Life in France. 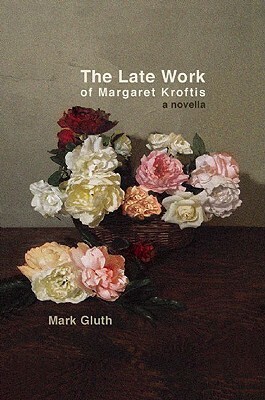 I discovered The Late Work of Margaret Kroftis by Mark Gluth towards the end of 2010 when Flavorpill (and every other media/literary/cultural blog) was ranking and listing off the "best-of's" for 2010. One of the lists I was particularly drawn to was the 5 Must-Read Small Press Titles from 2010, maybe because the criteria for this list was so specific, or maybe because after seeing Deb Olin Unferth give a reading at Knox last year that maybe lots of really great writers get their start through small press publishing companies. Either way, the list was intriguing, and after a bit of debate I settled for The Late Work of Margaret Kroftis because the cover was just so darn gorgeous. In case you didn't know I have a "thing" for still-life paintings. I know what you're thinking - don't judge a book by its cover. But honestly, I sometimes go to Myopic Books or Half Price Books not knowing what I want and being simply surprised by a story that I picked based merely on the aesthetic presence of the cover. This book was not only wonderful to look at, but also wonderful to read. A novella broken down into three parts, with lines and words so beautiful that it's hard not to sit there underlining the entire book. Daydreams described from an unidentifiable third person narrative, characters whose stories overlap, histories repeating themselves, dreams and dreams becoming a reality, solitude, isolation, and the tiny moments of sadness that are mirrored by the lovely pretty things in life. This book isn't so much a story as it is a series of really beautiful images brought together to evoke a whole series of emotions. It's kind of like the cover of this book, and maybe why I love still-life paintings. Because they capture something fleeting - flowers mid-bloom, fruit freshly picked, a table with a beautiful object, painted into another beautiful object - with the promise that nothing is forever. Everything dies, everything returns to earth, so we might as well enjoy the beautiful things while they last. I loved this book, and I highly recommend it. Since I enjoyed this book so much, I'm also interested in reading other books from Akashic/Little House On the Bowery. Do you have any independent/small-press titles or writers you enjoy reading? Any little known secrets you'd like to share? Last night I watched Adaptation for the first time - and oh my god does it go hand and hand with this book. The story within a story within a story, and the strangeness of the character/fiction/reality overlap is uncanny. Not to mention there are flowers on the cover of The Orchid Thief. I would highly recommend watching this film AND reading this book. And if you're into books with stories of cycles, life, and death - and the instances of repetition within these cycles, written in the most beautiful language, read 100 Years of Solitude by Gabriel Garcia Marquez.